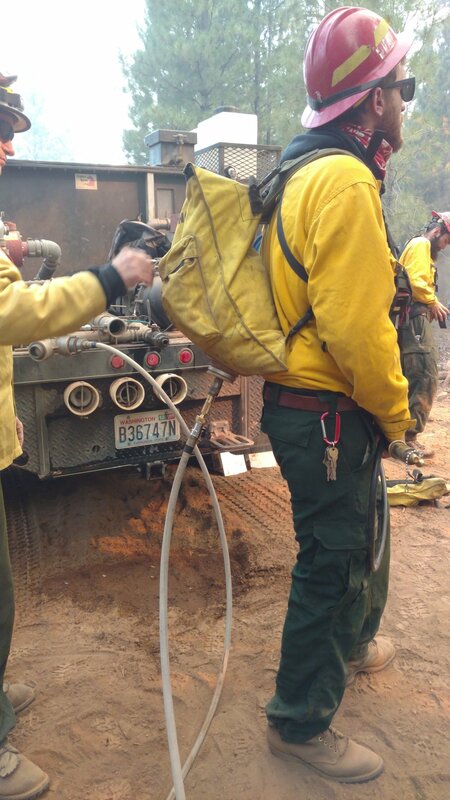 The Dual Purpose Nozzle was created by a wildland firefighter for wildland firefighters. The nozzle will save time, reduce fatigue, secure the fireline, and rapidly re fill the bladder bag with out even taking it off the firefighters back. This Dual Purpose Nozzle is solid Brass with one O-ring and one gasket for easy maintenance. This nozzle is a great mop up tool with a great fog pattern for water conservation, and adjust to a powerful straight stream for distance and penetration. The dual purpose is the tip can be inserted into a bladder bag for rapid re-fills without having to dismount the bladder bag from the firefighters back. The forester twin tip nozzle can be fitted with the Dual Purpose Nozzle for tripple the use. The Dual Purpose nozzle attached to the Forester nozzle now it will Have a nice fog, straight stream, and re fill bladder bags with the quick connect.